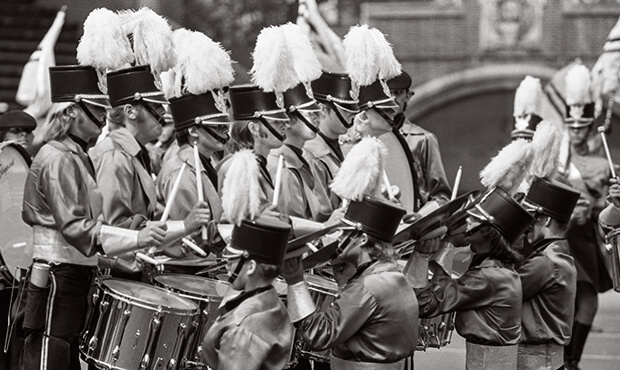 DCI World Championship events were held in Philadelphia in 1975, the "Birthplace of American Democracy." It was the start of the nation's yearlong Bicentennial celebration that would culminate when the show returned to the city the next year. At the event, Santa Clara Vanguard received perfect scores in all three General Effect captions of the day; Visual, Brass, and Percussion; the only time this ever happened. Still, Vanguard couldn't overcome the Madison Scouts juggernaut that won its very first World Championship title. Despite placing third, the Blue Devils were still quite a young corps, growing out of a drum and bell corps just five years earlier and not taking a national tour until 1973, placing 24th at the DCI World Championship Prelims. The second year of touring brought the Devils to Ithaca, New York, where the corps finished the summer in ninth place. The 1975 season was the last year for the corps' satin uniform blouses, which in black-and-white photos made the corps look like so many other ensembles of the day. The production showed off a new jazz direction for the corps, starting with John LaBarbera's driving "Space Shuttle," written for Buddy Rich's 1972 big band album, "Stick It." "Space Shuttle" started off with the color guard rifles spreading out to pull the curtain on the contras and five sparkling silver timpani. The reflective surfaces of the timpani bowls were courtesy of very carefully applied contact paper. The next section of the show was a medley of three songs by Tower of Power, the rhythm and blues funk band from the San Francisco Bay region. Like the band, Chicago, Tower of Power featured a brassy horn section. The medley started with the mellow "Love's Been Gone So Long," written by guitarist Bruce Conte for the group's 1974 "Back to Oakland" album. One of the coolest drill maneuvers of the year was when the Blue Devils spread 45 yards across the field in five separate pods consisting of three curved lines; rifles in front, horns in the middle and flags behind. The five pods each moved forward toward each other, locking into three continuous arcs that were 25 yards at the widest point. It was simple, effective and downright brilliant. The tune went on to feature Bonnie Ott, sister of Jim Ott, the corps' arranger. 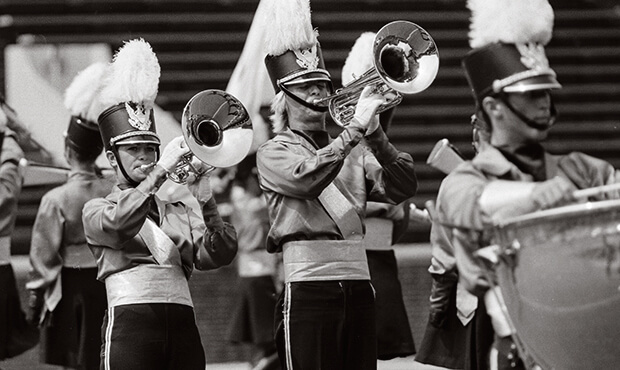 Her mellophone solos—of which she had three in 1975—made her well known throughout the drum corps community. "Love's Been Gone So Long" segued into "What is Hip?," off Tower of Power's 1973 self-titled album. The final piece in the medley was the ultra-funky "Squib Cakes," written by Tower of Power keyboardist Chester Thompson for the band's 1974 "Back to Oakland" album. Three of the remaining selections in the show were pieces composed and performed by flugelhorn player and bandleader Chuck Mangione, a favorite of Blue Devils founder Jerry Seawright. Not only did Seawright encourage the Blue Devils' staff to check out Mangione's music during the corps' early years, he also arranged in 1975 for the Blue Devils to perform as an opening act for the artist at the Concord Pavilion. The massive outdoor venue, opened in 1975, was designed by world famous architect Frank Gehry and has long been noted as one of America's preeminent facilities for jazz, pop and rock artists. The beginning of the Mangione section featured "Legend of the One-Eyed Sailor" which was played by the corps in its 1974 production, again featuring mellophone player Bonnie Ott. The tune came off Mangione's 1973 "Land of Make Believe" album, which also gave us "El Gato Triste" and "Land of Make Believe," two popular tunes performed many times by drum corps over DCI's long history. The next piece in the Mangione segment was the percussive ending section of "Feel of a Vision," also brought back from the corps' 1974 show. The work came off the 1970 "Friends & Love" double album, recorded with Mangione's band and the Rochester Philharmonic Orchestra. Also returning from 1974 was a percussion feature that interrupted the Mangione medley. "Overture in Percussion" originated as a quintet written by Anthony Cirone, who has written several frequently utilized books on percussion education and is one of the most performed composers of instructional percussion etudes. The show's closer was the beautiful "Chase the Clouds Away," from Mangione's 1975 album of the same name. It once again featured Bonnie Ott as part of a duet with a French Horn bugler Scott Tiret. Her solo is the same one she performed in the stands at the 2012 DCI World Championship Semifinals, along with other famed brass soloists to mark DCI's 40th anniversary. During this segment the horn line filled into a block behind the contra bass horns, compressed into two lines near the 50-yard line, and then opened up in a huge "V" form that resulted in a forward-moving company front. That form then split apart to let the drums through, taking the volume at the end of the show into the stratosphere. After that, it wasn't a huge shock when the corps won it all in 1976. No other corps has experienced that kind of meteoric ascent that the Blue Devils enjoyed over such a short period of time, and it would be miraculous if we ever witnessed an equivalent feat in competitive status from another drum corps in the future. For this week only, you can save on the Legacy Collection DVD that contains this complete Blue Devils performance, along with all finalists from the 1975 DCI World Championships. Discount DVD offer ends Monday, Feburary 2, 2015.